Novartis has confirmed a second quarter adjusted earnings per share of $1.22. That on sales of $12.24 billion. In the US think we will maybe get another rate hike this year but next year we will may be see the Fed revise their rate hike path downwards. 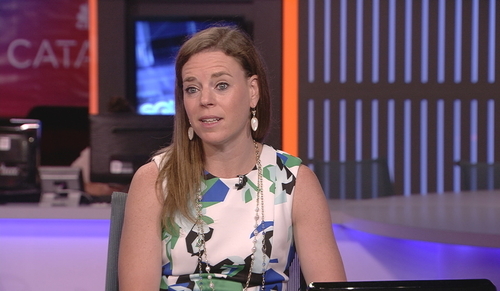 On set Megan Greene says the Fed is going to have to accept hard data as the benchmark for deciding its interest rate path. The Swedish mobile network maker Ericsson has reported worse than expected earnings. The operating income came in at -1.2 billion Swedish crowns, generating a net loss of -1 billion. The market had been expecting a net loss of around 500,000 Swedish crowns. Ericsson posted Q2 revenue of 49.9 billion Swedish crowns, just shy of analyst estimates. 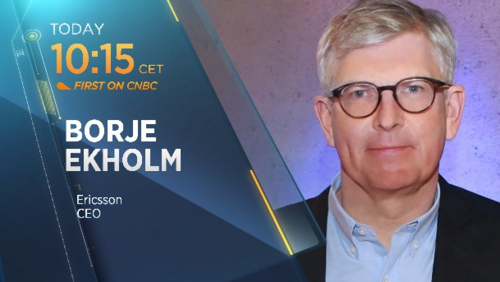 We'll speak to Ericsson CEO Börje Ekholm at 10:15 CET. This stunning overnight move by Netflix is yet to be incorporated to its open market performance. The firm has impressed in earnings by adding 5.2 million new customers during the second quarter. Proctor and Gamble is the target in the largest proxy fight ever. 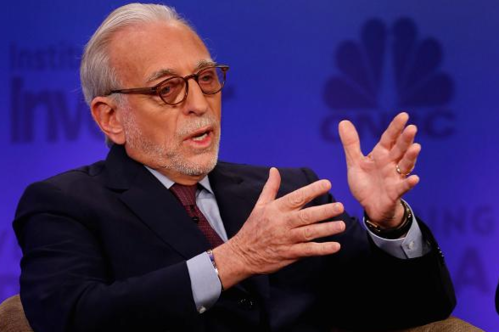 Billionaire investor Nelson Peltz is taking on the firm and seeking a board seat. His firm Trian owns about $3.3 billion dollars of P&G stock. P&G's average selling price across the product line is 40% higher than the rest of the industry. They are also number 1, but yet their margins, albeit are right up with the top guys in the business, they’re bigger than anybody else and they have this 40% price advantage. Something's wrong. Something is wrong. They have taken $10 billion of costs out since 2012 and we can't find a penny of it. Moody's has stated that the EU-Japan economic partnership will be credit positive for Japan. Moody's says the deal will promote Japanese economic growth and productivity by raising competitiveness of Japanese industrial products sold into European market. Dutch vitamin company Royal DSM expects over 10 percent annual revenue growth in China during the second quarter. Speaking to China Daily, CEO Feike Sijbesma said he wants to continue seeking investment opportunities in the country. Royal DSM has 21 operations in China and Geoff asks him if he is nervous about China's economic future and its debt levels. The DSM leader says European companies are still trying to work out how to benefit from China's long term economic plan. On the company's business Sijbesma says people all around the world are looking to become healthier and that is helping to sustain a continued growth in sales. Shares in DSM have had a healthy run in the last year. French real estate investment trust Gecina has announced it is launching a share capital increase with preferential subscription rights for approximately 1 billion euros. Gecina says the net proceeds will be used to finance a portion of its acquisition of Eurosic, another French real estate investment trust. Existing shareholders will be entitled to receive preferential subscription rights. The subscription price for new shares will be 110.50 euros per share. The subscription price reflects a discount of 20.87 percent to the stock closing price on July 14. Vodafone Qatar says it's made progress on restoring 2G voice services and is now focusing on restoring full connectivity across the network with the aid of global network experts. The company says it will announce a compensation plan within 24 hours of service restoration. This after the company said on Monday that access to its network was affected by technical issues. First quarter revenue rose 1 percent at Royal Mail, with strength in the firm's pan-European parcel delivery business offsetting weakness in the UK. The company kept its guidance unchanged for full-year 2017. 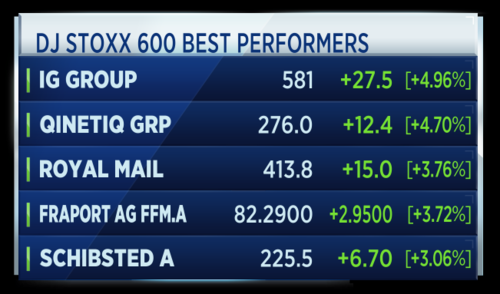 Royal Mail among the top movers in Europe. 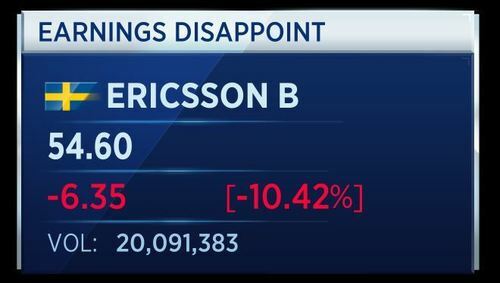 Ericsson meanwhile is the biggest loser in Europe after posting a bigger than expected second quarter loss. Discussing government bonds, Edmund Shing, global head of equity derivative strategy of BNP Paribas, warns the central banks are taking away the “punch bowl” of monetary stimulus. If you look at central bankers, they are taking the punch bowl away. They’re inching away; they’re not running away. But nevertheless they are inching away. The Federal Reserve is withdrawing liquidity and will be withdrawing more liquidity. I think the Bank of England will have to follow at some point in the future. The ECB will of course taper, if for no other reason than they cannot find enough German bonds to buy. Shing says taking away the punch bowl from financial markets will remove support for riskier assets, which may create problems. Minutes from the most recent meeting of the Swedish central bank are out. The Riksbank's Martin Floden says the economic upswing and reduced risks abroad mean that setbacks for the upturn in inflation are now less likely. Floden says this in turn means the risk of needing more expansionary monetary policy during the autumn has subsided. He adds the upturn in underlying inflation is still dependent on support from the expansionary monetary policy. Stefan Ingves, governor of the Riksbank, says it is important future rate rises are not pre-empted. He says inflation touching 2 percent in the short term is not stable enough. He says it it important to keep to the bank's monetary policy plan and to be prepared to work with the entire balance sheet until inflation stabilises around 2 percent. He adds that wage development is uncertain. Finally, Per Jansson said it is pleasing that prices for services have recovered significantly in recent months. He says he is prepared to spearhead and stand behind a decision to cut the repo rate, if it needs to be. He adds that it will be difficult for the Riksbank to stop new purchases altogether if the ECB continue to buy more assets next year. He says that he does not expect Swedish monetary policy to change tack soon. 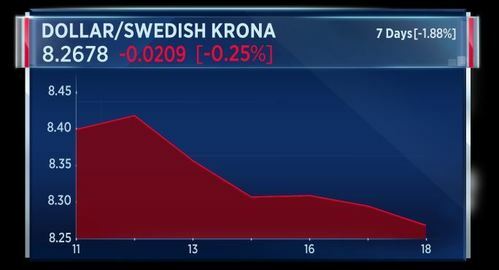 Following the release of the central bank minutes, the Swedish crown is up 25 basis points against the U.S. dollar. 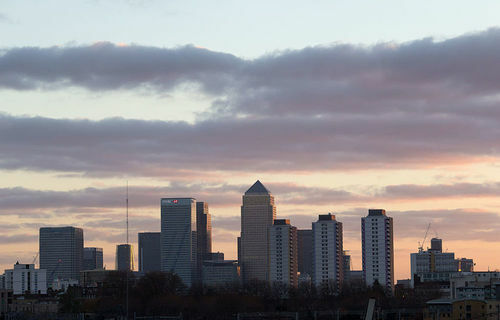 London's economy is 'beginning to wobble' from the effects of Brexit, according to a report from the Centre for London. The think tank said it is too early to know how the UK's exit from the EU will play out, but that weaker growth in the housing market, slowing job creation and fewer EU citizens registering to work were the first signs of the impact of Brexit. David Davis and Michel Barnier have kicked off the first full round of Brexit negotiations. Davis raised eyebrows by returning to London and leaving talks in the hands of teams of civil servants, after a brief meeting. But officials said the Brexit secretary will be back in Brussels on Thursday, to join Barnier in endorsing a first set of partial agreements. 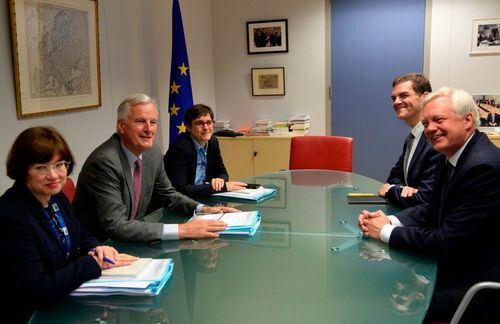 The British team's lack of notes during the meeting -- compared to the EU side's pile of papers -- also sparked jokes from critics in the U.K., who see the government as unprepared. Poor reception for Ericsson! Shares in the telecoms giant head for their worst day in 9 months, after it slashes its 2017 outlook amid declining sales. Swiss pharma giant Novartis beats expectations in the second quarter, amid improvements in its eyecare unit Alcon, as the CEO tells this programme the collapse of Republicans' latest healthcare bill will not affect his business. Shares of Lufthansa struggle, despite the German airline lifting its profit target for 2017, in a busy summer for bookings. Netflix blows away expectations for subscriber growth, with investors scrambling to bid up the streaming service's stock, sending it more than 10 percent higher. The ECB says it sees rising demand for corporate, mortgage and consumer loans in Q3, according to its latest lending survey. The ECB says banks expect easing credit standards for loans in the next quarter. The ECB says access to wholesale and retail funding improved in the second quarter. Credit standards for businesses eased in Q2. 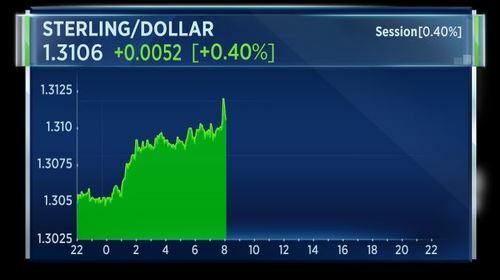 Ahead of U.K. inflation, retail price and house price data, sterling is rising against the dollar. It spiked to $1.3126, its highest since September 16 and up around 0.5 percent for the day, just before the hour change. 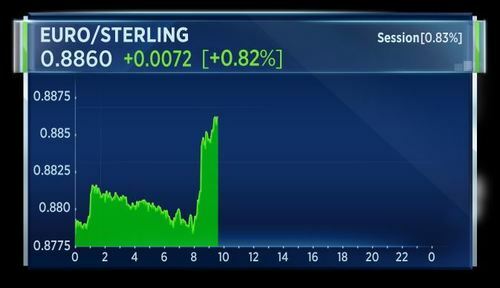 Sterling pared back but remains up 0.4 percent. Richard Kelly, head of global strategy at TD Securities, says he never bought into the “Trump trade”. He says there’s been a big asset allocation trade going on, and he says it’s a mistake to believe this was driven by President Trump. He says Trump was just a catalyst for it. People mistook the fact that U.S. data was becoming phenomenally strong before we went in there. It was the strongest data surprise. When Trump was elected, it was the strongest data we’d had in the U.S. in five years. It was the strongest data in the history of the Eurozone, but no one was focusing on it, because everyone was focusing on Hillary versus Trump. He got in, everything was priced in, we kept going and people probably built a little bit of irrational expectations on the back of that. Since then, he says, people wanted to be long U.S. fixed income and long European equities, which helped to bring the Dow Jones up. Ericsson has posted a bigger than expected loss in the second quarter. The Swedish telecom equipment maker reported an operating loss of 1.2 billion Swedish crowns, compared to a profit of 2.8 billion crowns a year prior. 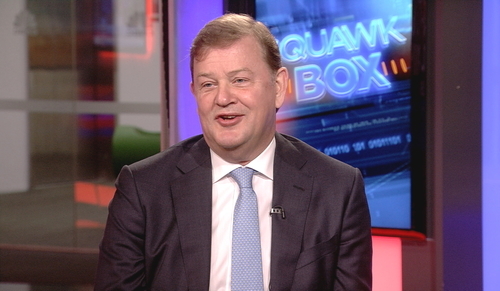 Börje Ekholm, CEO of Ericsson, says the quarter was unsatisfactory and adds the market is tighter for telecoms. They have seen tighter markets across Europe, Latin America, the Middle East and Africa. We believe the market will decrease a little bit more than we anticipated before. 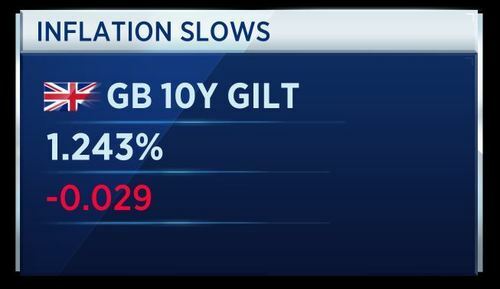 Shares in Ericsson are now down more than 10 percent in European trade. 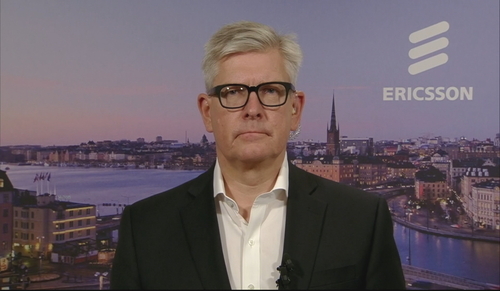 Börje Ekholm, CEO of Ericsson, says the company will take out at least 10 billion Swedish krona in costs by next year in order to double the operating profit. It is a tighter market out there. We need to take costs out faster and that’s what we’re trying to do. At the same time we need to invest in R&D to be competitive long-term and that’s the strategic direction we have. U.K. CPI inflation is flat in June, unchanged month on month. Year on year it is up 2.6 percent, lower than forecasts of 2.9 percent. The fall in CPI to 2.6 percent in June from 2.9 percent in May represents the biggest drop between two months since February 2015, according to the ONS. It said the fall was due to the drop in fuel prices. Sterling turned negative against the dollar on the news, giving up all the gains made earlier in the session. House prices in May rose 4.7 percent year on year versus 5.3 percent in April. London house prices grew 3 percent year on year in May, the second slowest growth in all regions of the U.K.
Producer input prices fell 0.4 percent month on month in June, and is up 9.9 percent uyear on year, above expectations. This is the lowest year on year figure since Sepember 2016. 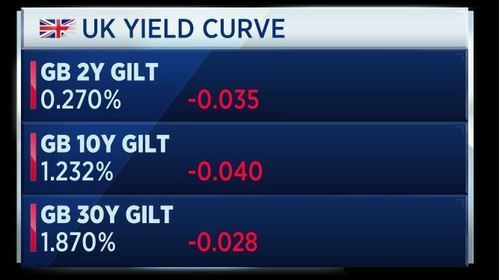 10 year U.K. gilt yields slide following the U.K. inflation data. The yield dropped to 1.24 percent from 1.284 percent earlier. 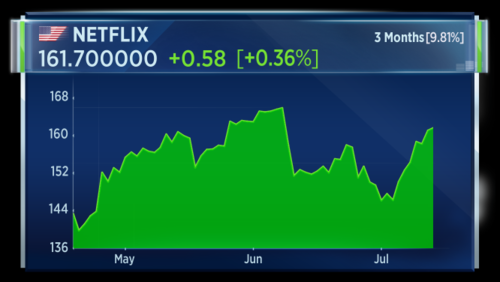 Netflix shares soared more than 10 percent in after-hours trading after the TV and movie streaming service smashed its subscriber targets. It added 5.2 million new customers during the second quarter, with a significant proportion coming from non-U.S. markets. Netflix now expects foreign growth to result in its first full-year profit for overseas markets in 2017. 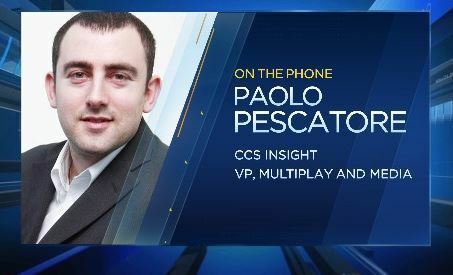 However, Paolo Pescatore, the vice president of multiplay and media at CCS Insight, warns Netflix is burning through a lot of cash to create original content. He says this is a concern for any media business. Netflix needs to differentiate itself from competitors. This can only be done through content, either licensed content or original content. Netflix is placing some huge bets that its investments in the original content will pay dividends not only in one particular market, but also globally. It goes to show, certainly in this quarter which is traditionally a poor and challenging quarter, not only for Netflix but for other providers as well, and they’ve exceeded in smashing all expectations. He adds that Netflix has been smart to rely on local telco partnerships to increase its presence in markets outside the U.S. The ZEW institute's German economic sentiment index for July falls to 17.5 points from 18.6 points in June, below expectations. The curreny conditions index for July also fell to 86.4 points to 88.0 points in the previous month, again below expectations. The ZEW says the outlook for German economic growth continues to be positive. 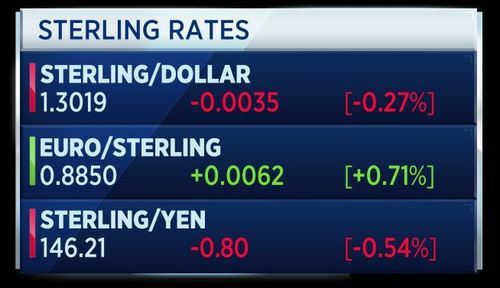 Sterling is trading down sharply against a host of other global currencies after U.K. inflation slowed from May to June. Jake Trask, FX Research Director at OFX, says the fall was apparently due to falling prices for car fuel and recreational and cultural goods. 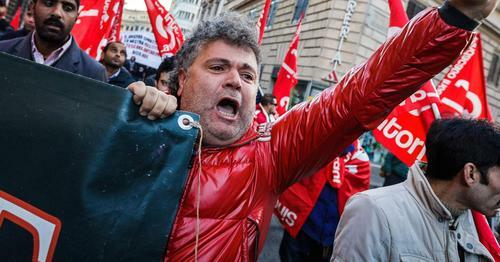 The gap between CPI and wage growth has narrowed from 1.1 percent to 0.8 percent, easing pressure on consumers hit by the depreciation of the pound since the Brexit vote. The drop in CPI could see Mark Carney, labelled by some as an ‘unreliable boyfriend’, again change his tone on interest rates. At a conference in Portugal late last month, he shocked the markets by suggesting that rates may need to rise by the end of the year to combat inflation. Should the spread between inflation and wages remain where it is, he may be forced to make another about-turn. The chances of an interest rate hike this year now seem remote – and the same may even be true for 2018. 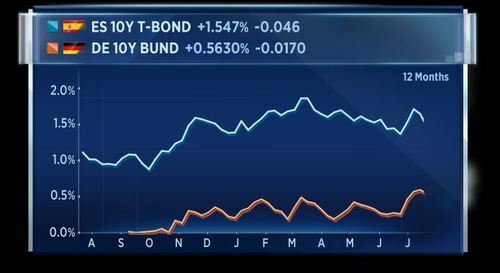 The spread between 10-year German and Spanish bond yields has narrowed to less than 100 basis points. The spread is now at its tightest since Septembr 2016, according to Reuters citing Tradeweb. Slowing inflation means the Bank of England is less likely to hike interest rates in the coming months, therefore increasing the appeal of government bonds. Shilen Shah, bond strategist at Investec Wealth & Investment, says the inflation data removes some of the central bank's "hawkish urgency." The downward surprise in June’s inflation print removes some of the hawkish urgency within the BoE, with petrol prices and recreational items being the primary contributors. The inflationary impact of Sterling’s fall following the Brexit vote seems to have lessened following the recent one-year anniversary of the Brexit vote. U.K. year-on-year inflation slowed to 2.6 percent in June from 2.9 percent in May. The ONS said this was the biggest drop between two months since February 2015. A spokesman for the U.K. government's treasury department has published a statement in reaction to the data. While it is encouraging that inflation was lower this month, we appreciate that some families are concerned about the cost of living. That’s why we have introduced the National Living Wage, which is helping to boost earnings by £1,400 a year, and why we’ve cut taxes for millions of people to help them keep more of what they earn. We are also increasing our free childcare offer to help 400,000 working parents. The euro is up sharply against the U.K. currency. Among the inflation data released this morning was the retail price index (RPI), another measure of inflation. Unlike CPI, which was unchanged in June, RPI increased 0.2 percent on the month. On the year, RPI rose 3.5 percent. While the RPI reading is used less often, it is tied to many parts of the U.K. economy. Student loan debt, rail fares and index-linked gilts use this measure of inflation for calculating interest and price rises. As such, increases in the RPI can be very costly for U.K. consumers. UnitedHealth reports Q2 earnings per share of $2.32, on net profits of $2.28 billion, from revenues of $50.05 billion. The adjusted earnings per share of $2.46 beat the Thomson Reuters IBES forecast of $2.38. 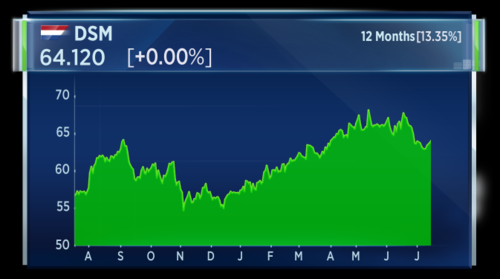 UnitedHealth raised its outlook for 2017 earnings to a range of $9.75 to $9.90 per share. The Republican-led U.S. House budget panel has unveiled its 2018 fiscal budget plan, with reconciliation instructions for tax reform. The plan sets a path for the partisan repeal of Dodd-Frank Wall Street reforms, according to a Reuters report. The budget includes $4.02 trillion in outlays for 2018, including $621.5 billion for defense. 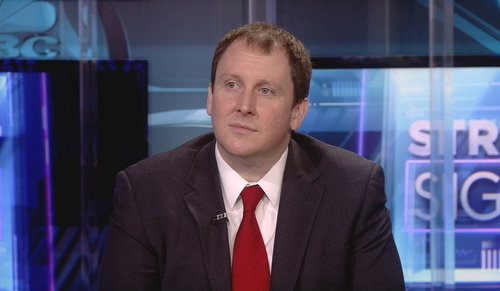 The plan seeks $203 billion in savings over a decade from mandatory programms such as welfare. 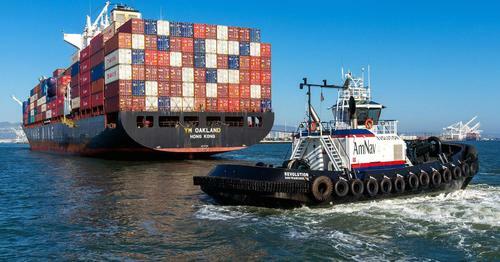 The plan expects to reach a surplus by 2027 based on a forecast of 2.6 percent annual U.S. growth. Electronics manufacturer Littelfuse has issued a revised Q2 earnings guidance. It expects sales in Q2 in the range of $312 to $314 million. It expects GAAP diluted earnings per share between $2.09 and $2.13. The revision is due to stronger demand exceeding forecast across the electronics segment and a lower adjusted effective tax rate for Q2. Previous forecasts were for $1.92 earnings per share and revenue of £307.2 million. Johnson and Johnson reports Q2 net profit of $3.83 billion. Earnings per share was $1.40 on sales of $18.8 billion. The company sees full year adjusted earping per share of $7.12 to $7.22. The company says U.S. sales were $9.73 billion, with worldwide consumer sales of $3.48 billion. This represents an increase of 1.7 percent versus the previous year. Harley-Davidson reports second quarter net profit of $258.9 million. Revenue was $1.58 billion for the quarter. Earnings per share were $1.48, beating the IBES view of $1.38. However, the company says worldwide retail sales were down 6.7 percent in Q2 compared to the same period last year. Also, the company expects to ship 39,000 to 44,000 motorcycles in Q3, down 10 to 20 percent from 2016. 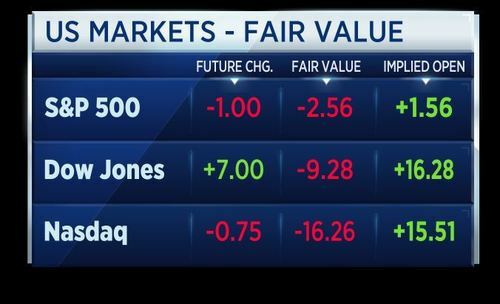 U.S. stock index futures point to a slightly higher open, as investor attention shifted to the bumper pack of earnings set to come out. As the painful and quite frankly embarrassing stumble out of Europe continues for the U.K., I watch with sadness at the pathetic lack of conviction of both the previous Remain and pro-Leave camps. It's never been easier for this journalist to sit on the fence in splendid apolitical isolation given that the pro-Brexit camp seem to not actually believe a word they are saying any more. Brexiteers seem to be tacitly admitting that their previous grandiose promises are in tatters, whether it's now a non-existent money tree for the NHS (National Health Service) or the failure of Germany to cave in over threats to tariffs on imported BMWs and Mercedes. And let's not even go there on immigration. 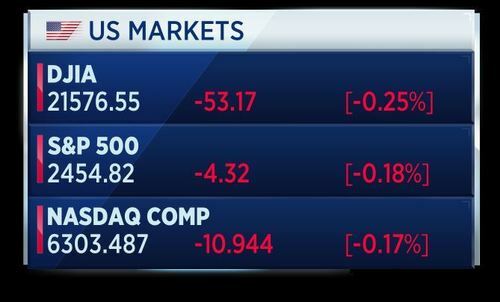 CNBCAs the painful and quite frankly embarrassing stumble out of Europe continues for the U.K., I watch with sadness at the pathetic lack of conviction of both the previous Remain and pro-Leave camps. The top three performing G10 currencies over the past week have been the Australian dollar, Canadian dollar and Norwegian dollar; the worst three have been the US dollar, euro and Swiss franc. This hasn’t always been the case. In recent months, the euro has often been in the top five performing currencies across both G10 and EM (Figure 1). Investor positioning shows that, as of one week ago, both asset managers and hedge funds were close to their most bullish euro positioning in a year. The challenge for the euro will be whether it can deliver news that would once lead to euro outperformance, such as a hawkish ECB this Thursday. In the absence of that, it is broad dollar weakness that could lift the euro, which also suggests that other currencies may be better placed to capitalise on such weakness. The latest US healthcare bill has been abandoned, which is the latest trigger for short-term dollar weakness. Last week, it was emails regarding a meeting between Donald Trump’s son and Russian contacts. These have taken the spotlight away from progress that has been made on the tax reform led by Gary Cohn and Treasury Secretary Steve Mnuchin. This likely has more chance to succeed as it falls into more conventional and tried-and-tested Republican policies. 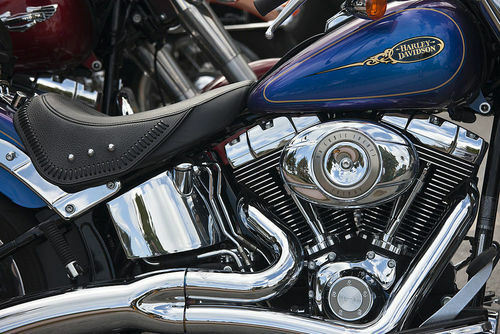 Harley-Davidson – The motorcycle maker earned $1.48 per share for the second quarter, 10 cents a share above estimates. Bank of America – The bank reported quarterly profit of 46 cents per share, three cents a share above estimates. Revenue topped forecasts, as well. 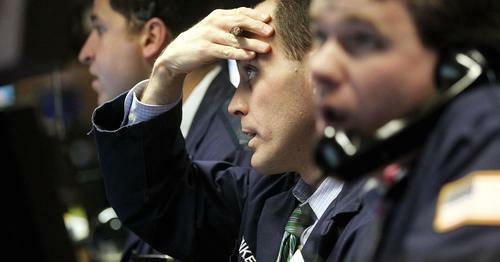 Higher interest rates helped negate the effects of a slump in trading. Johnson & Johnson – Johnson & Johnson beat estimates by three cents a share, with adjusted quarterly earnings of $1.83 per share. Revenue came in slightly short of expectations. Netflix – The video streaming service posted a much-larger-than-expected addition of 5.2 million customers for its latest quarter. Tesla – The automaker added two independent directors to its board of directors, naming 21st Century Fox CEO James Murdoch and Johnson Publishing CEO Linda Johnson Rice to the board. PayPal – PayPal struck a deal to offer Visa debit cards in the European market, according to the Financial Times. CNBCU.S. stock index futures pointed to a relatively flat open on Tuesday, as attention shifted to the bumper pack of earnings set to come out. U.S. import prices fell for a second straight month in June amid further declines in the cost of petroleum products, suggesting inflation pressures could remain benign for a while. The Labor Department said on Tuesday that import prices decreased 0.2 percent last month after an upwardly revised 0.1 percent decline in May. CNBCU.S. import prices fell for a second straight month in June amid further declines in the cost of petroleum products, suggesting inflation pressures could remain benign for a while. 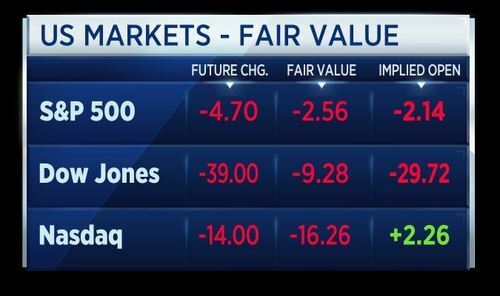 U.S. stock index futures pointed to a mixed open, as investor attention shifted to the bumper pack of earnings set to come out. In earnings news, IBM is one of the major names set to report. 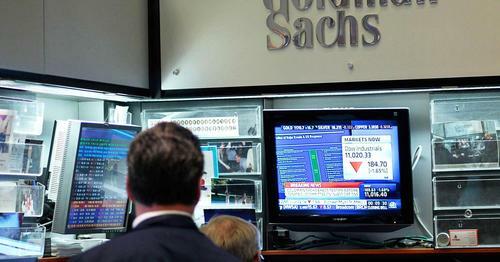 Bank of America and Dow components Johnson & Johnson and Goldman Sachs reported earlier on Monday. CNBCU.S. 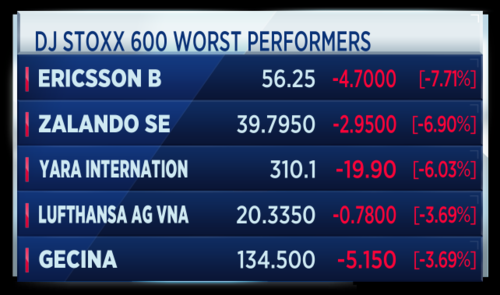 equities opened mostly lower on Tuesday as investors parsed through more corporate quarterly reports.